We now use the word “was” because, despite city-imposed protections, the current owners, the charter school organization Stem Prep Academy, gutted that Sanctuary interior over the past few months. The action is shocking for many reasons. WAHA featured the former St. James Armenian Apostolic Church on a historic architecture tour in 2008, and members of the Preservation Committee had the pleasure of meeting with Armenian church officials to learn more about the interior features and, especially, the designs of the murals and the stained glass windows, which depict Armenian Saints as well as the Armenian Church in the Middle Ages. By then, the property had been sold and an adaptive reuse project was planned to convert the entire site into a charter school. WAHA worked with the charter school officials to create a plan whereby the Sanctuary would become the school’s multipurpose assembly room. However, Stem Prep, which has occupied the site for one year with its Math and Science College Preparatory Charter School, and the recent prior owner, Pacific Charter Schools, decided to eliminate the Sanctuary in order to build a basketball court and gymnasium -- even though their own historic consultant recommended methods to retain and protect the historical character features. Importantly, this plan was concealed from the community, key city planners, the neighborhood council, and Council District 10 until it was too late to save anything. So, now everything is demolished, plaster removed, floors removed. The murals are gone (with possibly one exception). The mezzanine is gone. Wainscoting and copper niches are gone. The stained glass remains, but will be covered on the interior, light not to shine through. Exterior features are intact, but school officials would also like to remove the rooftop copper crosses, to erase the building’s association with religion, according to Eric Barlow, Stem Prep’s Chief Operations Officer. The loss is doubly shameful due to the Sanctuary’s association with Armenian heritage. Church architecture is always a symbol of the presence of the sacred in the everyday world. But for Armenians the Church is also a sign of their survival and endurance in the world. In 2009 the City adopted an environmental clearance that required that the Sanctuary be preserved and any work undertaken utilize the Secretary of Interior Standards. Specifically, the owners were admonished that no historic materials were to be removed. A subsequent Conditional Use Permit (“CUP”) the same year, and a City Planning Commission further approval the following year, repeated the conditions and mitigations. They submitted a different set of plans (showing a basketball court and demolished Sanctuary interior) to the HPOZ unit and Building and Safety. 2). The HPOZ planner never contacted the Expediting Unit planner, and never reviewed the original land use cases, and thus cleared the application based on exterior preservation only. 3). The project was submitted to the City‘s Valley office for building permits and project planning. The Planning Department staff member ALSO failed to look up and review the prior cases, and she approved/cleared the project. Since neither planner contacted the planner for the main case, he never knew there were two sets of project plans floating around. 4). The other factor was that multiple city officials along with the owners’ historic consultant made an error, thinking that the building’s exterior designation in 2011 as a “Contributor” to the Jefferson Park HPOZ was what the original 2009 conditions and requirements referred to – somehow not realizing that the historical protections for the Sanctuary two years before there was an HPOZ would therefore have nothing to do with the HPOZ. 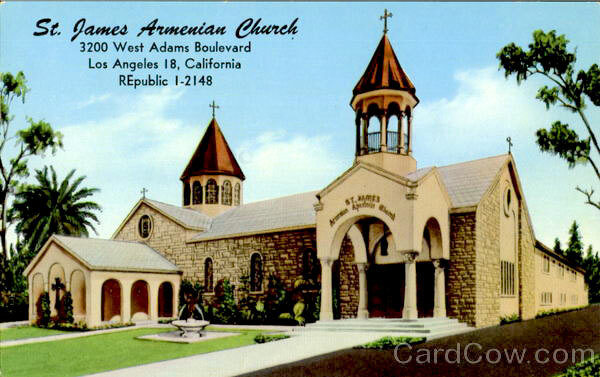 The St. James Armenian Apostolic Church was consecrated on December 15, 1957. At the time of its consecration the congregation was the largest Armenian Church in California. Each of the apostles was surrounded by a field of gold leaf. Gold leaf was utilized throughout the murals and decorative motifs, which added a subtle glow to the Sanctuary. This luster was enhanced by the four chandeliers above the main aisle and by those that acted as pendants at the interior base of each colonnaded vault. The thousands of crystals that dangled from the brass chandeliers refracted the light to increase the luster of the gold leaf throughout the sanctuary. Originally the walls of the nave were painted the same dark moss gray as the fields of the Coptic cross motifs along the colonnade walls. This enhanced the effect of the gold leaf and of the refracting crystals. It is not clear if any of the interior is recoverable. Stem Prep officials admit they threw away the materials. UNNC’s Planning & Zoning Committee voted to recommend to the neighborhood council’s Governing Board that the school be censured; that a nuisance revocation be initiated; and that the Planning Department look into its own processes and procedures to determine how this happened and how to prevent such mistakes and lack of mitigation monitoring to happen in the future. The Governing Board may take this up at its August 4th meeting or later in the year. UNNC has also asked the City to NOT issue a certificate of occupancy until the matter is resolved. WAHA is also exploring its options. It is clear that we have lost something significant. Between World War I and World War II especially, West Adams became home to thousands of refugees escaping oppressive regimes, prejudice, war, and even genocide. They found safe haven right here in West Adams, but now one piece of that history, cultural heritage and connection to the past has been erased. Roland Souza is a current WAHA Board Member.